A scientific expedition to the Tibesti Mountains led by Dr. Stefan Kröpelin of the University of Cologne’s Africa Research Unit has returned to Cologne. The multidisciplinary research team explored the two highest volcanoes of the Sahara’s major mountain range and succeeded in collecting geological samples in the deep volcanic craters of Tarso Toussidé and Emi Koussi. Their analysis will contribute to the reconstruction of the past climatic cycles in the Sahara. The multidisciplinary team also conducted archaeological, botanical and wildlife surveys yielding interesting first results. The expedition was organized in the framework of project A2 of the Collaborative Research Centre 806 “Our Way to Europe”, which targets the reconstruction of environmental conditions during the migration of Homo sapiens from Africa to Europe (“Out of Africa 2”). The logistically challenging venture also aimed at the preparation of further field trips and at the feasibility of the establishment of a new geoscientific research station in Bardai, the chief oasis of the Tibesti. For the inhabitants of this remote, still largely unexplored region almost three times the size of Switzerland, the German research team offered a rare opportunity for international exchange. “It is hard to believe: We have sent a spacecraft 500 million kilometers into outer space to analyze soil samples on a faraway comet, but no one had yet collected sediments in the largest crater of the highest mountain of the planet’s major desert,” says Kröpelin. For thirty years the geoscientist wished to do fieldwork in the Tibesti, but it was always hindered by security concerns, logistical problems and the inaccessibility of the study areas. Now the time had come. From Bardai in the northwestern part of the volcanic mountain range, the expedition set off in four cross-country vehicles to Trou au Natron, a steep, almost 1000 meter deep volcanic crater at the foot of Pic Toussidé (3,315 m asl). Using a donkey caravan, the team was able to sample several-meter-thick layers of so-called diatomites, white lake deposits consisting of phytoplankton and green algae accumulated during the last “Green Sahara” period about 10,000 years ago, but also sediment remains probably dating back to the last humid period approximately 120,000 years ago. After a several-day-long journey through rough volcanic terrain, the field party reached their main destination at the southeastern tip of the Tibesti: the shield volcano Emi Koussi, the 60 by 80 km wide and 3,445 m high peak of the Sahara desert. On a 10-day hike and with the help of 11 pack camels driven by 7 cameleers, the expedition climbed the rim of the caldera and then descended into the 800 meter deep main crater below, Era Kohor. Here, too, the team found and collected diatomites and more ancient deposits. “This is evidence that there must have been sizeable freshwater lakes in these craters during different climatic cycles,” Kröpelin notes. 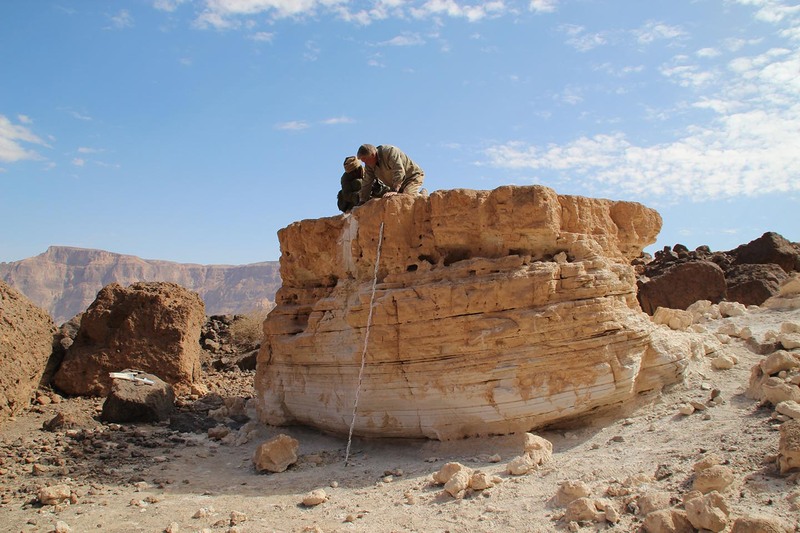 By defining their catchment area, the researchers can gauge past precipitation rates that help to clarify the climate history in the central mountain range of the Sahara. The chemical composition of the samples and their diatom and pollen content will allow inferences on past environmental conditions. The team also mapped and identified archaeological evidence from various prehistoric eras, including newly discovered petroglyphs. All in all, the researchers hope to obtain new insights into the environment our modern ancestors faced on their long path from sub-Saharan Africa to Europe more than 100,000 years ago – the focal issue of CRC 806. Kröpelin wants to use this strong backing to lobby for the recognition of the Tibesti as a natural and cultural UNESCO World Heritage site: “This is a unique volcanic scenery in the middle of nowhere. Geologically and archaeologically, it is of major significance. It is home to rare animal and plant species and has been a cultural landscape for a very long time. 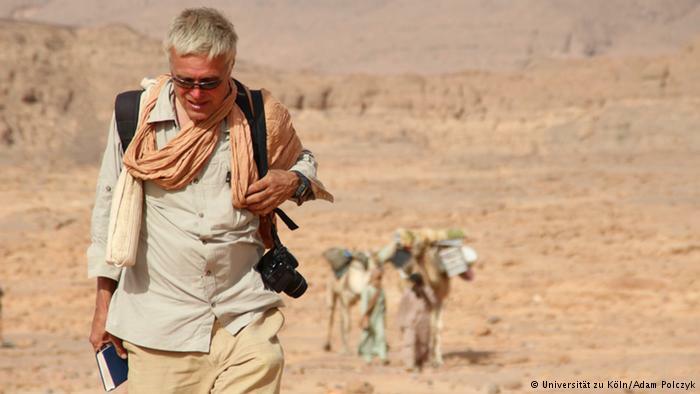 It should be recognized and protected internationally,” the desert researcher argues in continuation of his successful World Heritage initiatives for the Lakes of Ounianga (listed in 2012) and the Ennedi plateau (filed in January 2015).